We have just released the first version of our BF4 Borderless tool! This is a simple program which gives you control over the window that Battlefield 4 runs in. The main purpose of this is to run Battlefield 4 in a fullscreen window. This has the advantages of both worlds: you get full use of your screen, and the convenience of easily switching to other programs. BF3 Colour Tweaker 1.2 released! 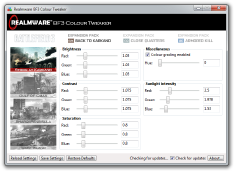 We have now released version 1.2 of our BF3 Colour Tweaker tool! This release adds support for all of the base game maps, as well as improving error handling and general stability. BF3 Colour Tweaker 1.1 hotfix! We have just released a hotfix for BF3 Colour Tweaker, which resolves a crash on start-up when some content is unavailable. Be sure to update to the latest version for the best stability! BF3 Colour Tweaker 1.0 released! 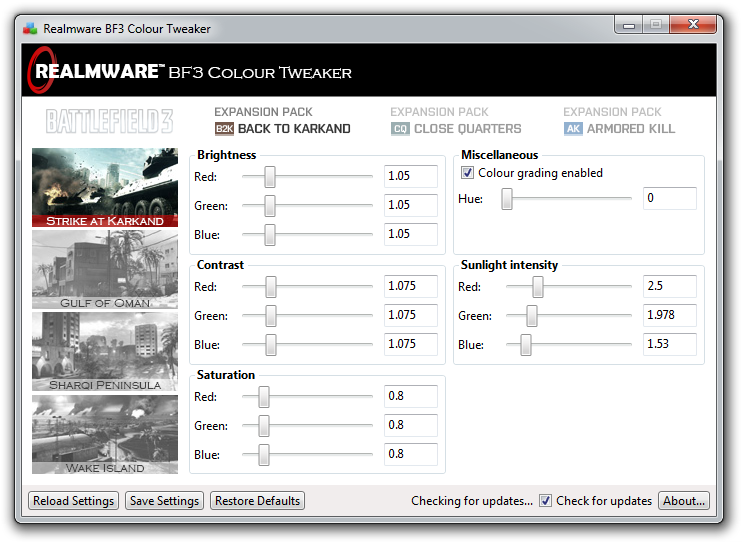 The first version of our BF3 Colour Tweaker has been released! This program allows you to edit the Battlefield 3 game files by tweaking the colour and lighting settings for each expansion map. The main use for this program is to remove the infamous blue filter (colour grading) which exists on every map. You can also tweak the brightness, saturation, contrast, and sun lighting to perfect the game’s visuals. We have a video showing how Back to Karkand looks with and without colour grading! Be sure to watch through until the end, as Wake Island is especially stunning! A screenshot of this program is included below. 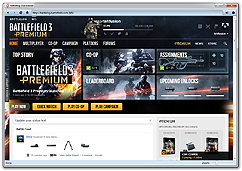 If you would like to see more, then check out the screenshots page on our BF3 Tools microsite. 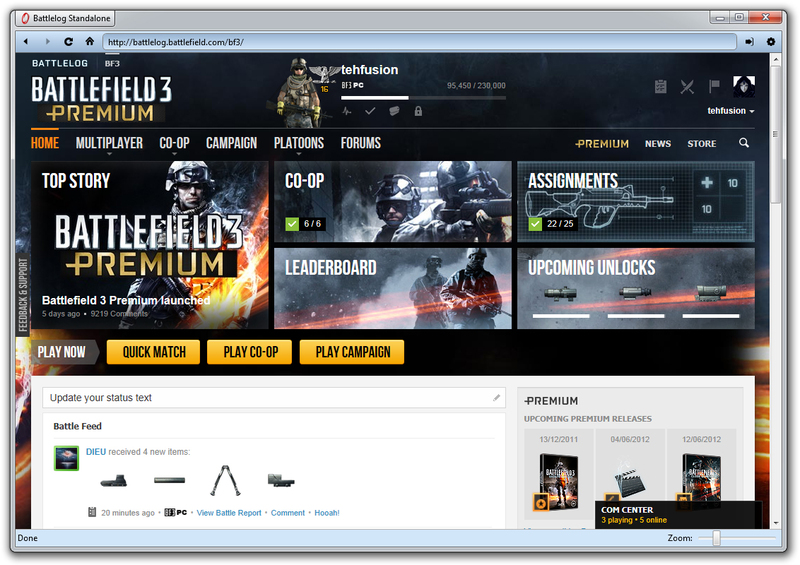 BF3 Settings Editor and Battlelog Standalone updates coming soon! We have been getting a lot of emails and comments recently regarding problems with our BF3 Settings Editor and Battlelog Standalone tools, caused by the recent updates to Battlefield 3 and the Battlelog website. Rest assured that we have big updates for both of these tools in the works, and they will be released soon. See the screenshot below for a sneak peek of Battlelog Standalone 2.0! Battlelog Standalone 2.0 will feature many requested improvements such as the ability to minimise to the system tray, zoom the page, hide the toolbars to maximise space, and more! It will have full hardware acceleration, and will also offer the user a choice of which web browser core to use: the engines of Internet Explorer and Google Chrome will both be available. Finally, we apologise for the long wait — we have been extremely busy with our various projects!